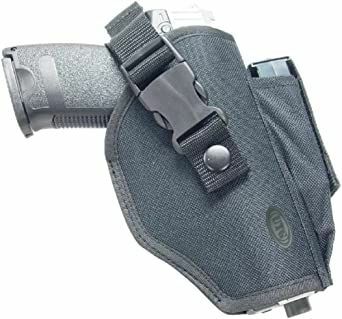 Think this holster would fly for IDPA? pa2a.org » The Armory » Gear & Accessories » Think this holster would fly for IDPA? Let me start this off, Ive got several kydex holsters that I know are good to go. My problem is that I have a couple pistols that I don't have holsters for and I'm really not keen on the current wait times across the industry. One in particular I cant find a OWB holster for at all (sig 220 carry). I happen to have one of these cheapos laying around that fits everything in my safe. Ive been tempted to start practicing with it but don't want to bother if its not allowed. Anyone seen somebody use something like this? Again I stress this isn't really a necessity, its more about not wanting to practice with something ill never be able to use. Safe to assume removing the strap would be a bad idea? I don't know about the IDPA rules, but anything with a strap that goes between the gun and your hand while you're drawing will really slow you down, and is borderline unsafe. I can see the gun flying out of your hand from interference from the strap. By design, you will have to hold the gun loosely while drawing to allow the strap to come off. That, combined with high speed and adrenaline is a bad combo IMO. ETA: Looking at the picture, it looks like the strap may be able to be adjusted so that it goes over the back of the slide, instead of the backstrap. If you can do that, it would be much better. I had not planned to use the strap so I'm glad I asked. Id rather just remove it all together. This is more of a "I'm in the mood to shoot this gun but only have this cheapass holster for it" than anything else. It's not going to be worth it if I have to change my normal routine. (02-16-2013, 08:46 PM)csmith Wrote: Safe to assume removing the strap would be a bad idea? Yup. All holsters have to have retention so that when the holster is turned upside down the firearm doesn't fall out. Quote: E. Must hold the firearm with enough tension to allow the wearer to complete normal daily tasks without fear of losing the weapon.